James Joyce & Ulysses comes to Sligo! 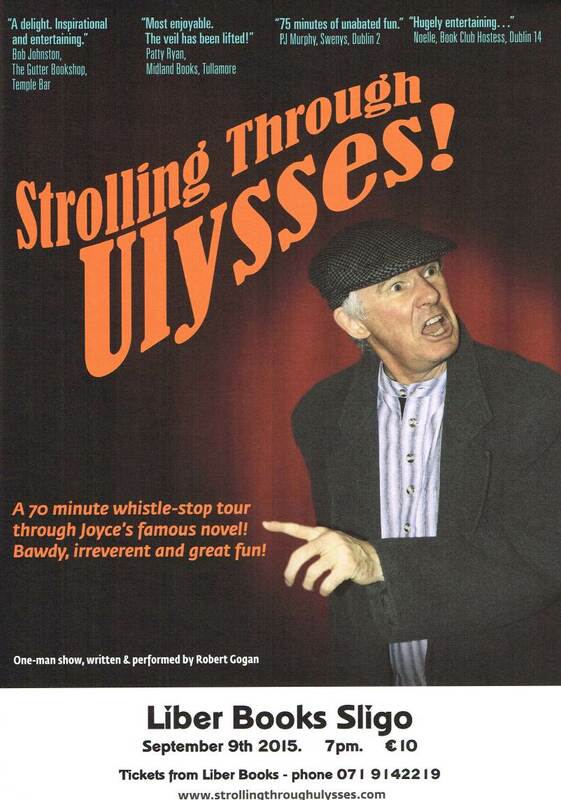 When Robert Gogan completed his one-man show about James Joyce’s Ulysses entitled Strolling Through Ulysses! he decided that there was no better way to perform it than on a nationwide tour of the independent bookshops of Ireland. The tour started in December 2014 with two special performances in the famous Swenys Chemist on Lincoln Place in Dublin, one of the many places immortalised by Leopold Bloom on Bloomsday – June 16th 1904 – and the tour has continued in a host of bookshops throughout Ireland. He was delighted to perform in the iconic Joyce’s Tower, Sandycove on February 2nd last (the anniversary of Joyce’s birthday, and also of the publication of Ulysses) to a packed chamber. He will be performing his show in Liber, Sligo, on Wednesday 9th September next at 7.00pm. Strolling Through Ulysses! is a 70 minute lighthearted whistle-stop tour through Joyce’s famous novel, highlighting the fun, action and characters of the book. The show is humorous, entertaining and informative and scattered with extracts from Ulysses which best illustrate the various aspects of Joyce’s writing – the comical, the descriptive and the complex. Gogan has also edited a new edition of Ulysses in which he has added some punctuation and formatting to help people to read the novel and derive the maximum satisfaction from it. Ulysses Remastered was published in 2012 and is available through all bookshops, including Liber Books. Strolling Through Ulysses! is on in Liber on Wednesday 9th September at 7pm. Tickets are €10 each. Tickets are available from Liber – phone 071 9142219. It is not suitable for children or young teenagers.